Technology in the home has finally reached the plumbing sector. Adelle King explains. Throughout the home, appliances are increasingly available with smart technology integration that allows home owners to control everything from their lighting to their coffee machines via a smart phone app. With how quickly this market is growing, it was only a matter of time until smart home technology reached the plumbing sector. From taps featuring LED screens that show the temperature to tankless water heaters with wireless connectivity, a number of new technologies have appeared in the US that promote the idea of ‘high tech plumbing’. Whereas an unknown pinhole leak in the pipes used to cause very costly water damage, there are now technologies available that can automatically detect leaks, shut off water supply and contact plumbers directly. This digital connectivity translates into direct cost and water savings, enabling customers to keep plumbing systems at peak performance during a time when more people are looking for innovative ways to monitor and reduce water consumption. The Environmental Protection Agency (EPA) estimates that in the US, the average home could save 10% of its water bills by eliminating leaks so there are major incentives for consumers to integrate smart technologies into their plumbing systems. Although this technology has yet to really take off in Australia, it represents a potentially huge untapped market for plumbers. “While the rest of the home is getting smarter, with voice assistants, smart thermostats and even WiFi-connected toasters, plumbing hasn’t seen this level of innovation until now,” says Flo Technologies chief executive and co-founder Gabriel Halimi. LA-based Flo Technologies was founded in 2015 by Gabriel and his father, Henry Halimi, who is a veteran plumbing manufacturer and mechanical engineer with more than 25-years of experience. Flo Technologies provides innovative and accessible technology solutions that enable and transform the security and conservation of water at home. The company’s first product, Flo, is a water monitoring and shut-off system that detects micro-leaks and other vulnerabilities anywhere in the home’s water supply. “This system prevents costly damage by giving home owner’s the tools to stop damage and better maintain their home,” says Gabriel. Gabriel says this is the most important aspect of the system and what makes Flo different from other systems on the market. “Water pressure in your home is like blood pressure in your body, and just as high blood pressure can cause your body serious damage, high water pressure over time can cause micro-leaks and bursts in pipes, fixtures and appliances. By monitoring the pressure proactively and alerting the home owner, Flo can detect vulnerabilities, including leaks as small as a drop of water a minute. The system features Flo Sense technology, which applies machine learning algorithms to learn home owner behaviour and tailor protection. When abnormalities are detected, Flo sends alerts to the home owner via email, through in-app messages or by text or phone call. “Depending on the issue, the home owner can remotely shut-off the water through the app from anywhere in the world. If the user doesn’t respond to the notification and the system deems the issue critical, it’s smart enough to shut the water off itself to protect the home,” says Gabriel. The system’s ability to automatically shut-off the water is powered by Flo’s MicroLeak technology, which temporarily shuts off the water at a time when no appliances or fixtures are in use, creating a closed, pressurised environment in the water system. 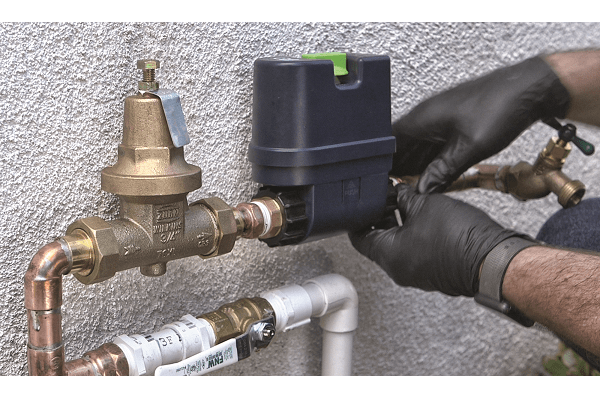 The MicroLeak technology runs up to eight different tests in real-time to monitor the home’s water usage, as well as a daily health test to ensure the integrity of the entire plumbing system. It looks for any loss of pressure in the line, a key early indicator of vulnerabilities. “Around one trillion gallons of water is wasted in US homes each year due to leaks and more than $US8,500 ($A10,699) is paid per water damage claim. With Flo, we aim to prevent this loss,” says Gabriel. All the measurements on the plumbing system’s flow rate, temperature, pressure and water usage are displayed on the smart phone app. Users can also receive troubleshooting tips, contact their plumber directly, compare historical patterns and set and monitor conservation goals. Additionally, Flo Technologies recently announced an Alexa integration that enables home owners to ask their voice assistant for updates on their water usage. Similar to other smart home devices, the Flo device is registered to the WiFi network and then a plumber installs the device on the home’s main water supply line. Once it’sinstalled on the supply line, Flo is plugged into a power outlet. “Flo is a special partner to the plumbing professional. It’s a cutting-edge system that will identify and alert to vulnerabilities in the home but it’s the plumber, as the service partner, who is essential to ensure the home is properly maintained,” says Gabriel. Flo currently has a number of units testing in the field throughout Australia and Gabriel says the company is excited about potentially expanding into the market in the future.